Pianos, like anything have a life-span. The average pian o will last for 70-90 years if they are looked after. After that time however they are no longer useable as a musical instrument. They will constantly sit out of tune, even if you get a good tuner, the piano can fall back out of tune within a day or two. You can still use the piano for Aesthetic/Furniture reasons, but not as a musical instrument. Pianos are so large, that to dispose of them you have to get specialist movers to take them away (for a price). This is the reason you see Upright and Grand pianos so cheap on eBay. 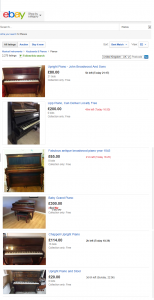 The seller can sell the piano for next to nothing, just so they don’t have to spend any money on the removal companies. If someone is looking to sell a good quality piano, they are usually sold at Auctions where potential buyers can actually play the piano before purchase. So finding good pianos on eBay is quite rare. Here is one experience, from the many, which some piano buyers have let us know about after they have bought pianos on ebay. I wondered if you had an upright piano for a beginner. We have an 8 year old girl who has just started to play the piano. We bought her a piano for Christmas from Ebay. Unfortunately we tried to tune it and after about two weeks it went out of tune again. The piano tuner did say if it went out of tune quickly then he doubted that it would be any good. Do you have anything in stock at the moment that would be good for a beginner. We live just outside Guildford in Surrey. We were very sorry to learn of Mr B’s bad experience from buying a piano online via ebay at Christmas for his daughter. This does seem to be an all too common experience. We would always strongly recommend that anyone contemplating buying a piano on ebay should first have it thoroughly checked by a fully trained and qualified piano technician. It is also important that the main person that will be learning or playing the piano should try the piano first in order to get a sense of the piano’s touch, responsiveness and general sound quality before buying. Fortunately, all the second hand pianos at J Reid Pianos have been fully checked by our qualified technicians and always meet our strict standards before being offered for sale. We have written directly to Mr B inviting him to bring his daughter to our North London showrooms so that he can select a piano for his daughter with the full confidence that the piano he buys will be of the appropriate standard and offer many years of playability. Read some of J Reid Pianos positive customer feedback. This entry was posted in How to Buy a Piano. Bookmark the permalink.